I recently bought this educational software program called TESS, which lets one experiment with creating “tessellations”, or tiled repeating pictures that follow a geometric pattern. 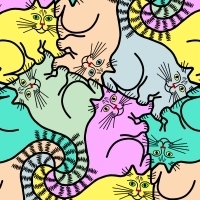 This fun design of tessellated Fat Cats, colored in various pastel hues, was one of my favorite first results, and I’m proud to offer it here. The large repeating pattern lends itself particularly well to linens and other home decor items, but we’ve put it on clothing and smaller giftware items as well with attractive effect! Hope you enjoy it as much as I enjoyed creating it!